Enprise recommends SCORE-POS, a comprehensive point of sale application for MYOB Exo. 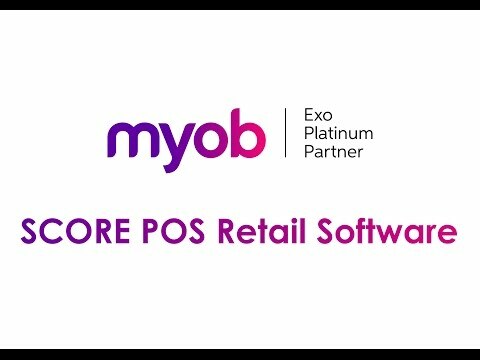 SCORE-POS is a comprehensive point of sale application for MYOB Exo. It is perfect for retailers with more complex requirements and wanting to drive more success from their customer data, more payment options and much more. Savvy retailers and wholesale operations demand a front-end solution that does more than ring up sales. It needs to help improve service, reduce cost and manage risk. SCORE-POS is a fully-featured software suite designed for Australasia’s quickly changing retail and sales processing environments. SCORE-POS moves beyond the traditional specialty store cash register to provide a Point of Service for technologically educated customers. SCORE-POS provides a highly flexible and affordable business management tool that allows retailers and distributors to meet the demands of today’s smarter consumers. Manage inventory and sales in real time. SCORE-POS integrates seamlessly with MYOB Exo inventory and debtor management systems to provide accurate real-time information at the point of sale. And because it updates your inventory by transaction, it’s easier to control costs and track orders – whatever and wherever the location. Multi-store/branch support. SCORE-POS allows you to interact with other sites directly through the retail system with minimum fuss. This gives you the flexibility to quickly see what’s in stock at one site, and then easily move it between locations to meet demand. With the correct security levels you can also review branch transactions, giving you complete visibility across the entire business. Functionality. Use powerful functionality to park or modify transactions, create bank batches or generate a total sales balance report all at the touch of a button. Schedule price changes and promotions. Managing promotions and pricing is painless thanks to SCORE-POS. Simply load promotions and price changes at any time and SCORE-POS will update the system automatically to give your team the right tools to attract more customers and generate more sales. Refunds. Handle refunds, credits and account receipts. SCORE-POS handles all the necessary transaction types including trade accounts with special pricing, credits and refunds as well as deposits, lay-bys and general account processing for the trade account customers. EFTPOS integration. SCORE-POS works with all software provided by the major EFTPOS companies. Your system will automatically be updated each time you install and upgrade from your EFTPOS supplier. Click below for an obligation-free demonstration.